At 8:45 a.m. on September 11, 2001 I was getting ready to leave for a day of classes at the university, as an adult university student. My husband and I never watch television, but he had the TV on that morning watching the news. He called me into the living room and I briefly watched the reports. We were confused and thought it must have been some kind of hoax, so I left for my classes. However, my husband had a horrible feeling of foreboding. He did NOT want me to go to university that day, I insisted. On the drive to school, things just didn’t feel right. I couldn’t put my finger on it. I felt a great deal of unease. When I arrived at school there was pandemonium everywhere. Every place a television existed; people were transfixed by the news and the images on the screen. Everyone was a bit dazed, in shock at the realization that it was real. A formal announcement was made to dismiss all classes. On the drive home, the distant sky near the Pentagon had a strange hue to it. I saw the Vice President’s motorcade on the highway, thinking he was probably on his way to Langley Air Force base. My husband was so very glad to see me, and we stayed very close to each all day in our solemnity. At times of great tragedy, people gather together. We want to be close to those we are about. Call those we love who are a great distance away. We feel unsure, frightened by the brutal reality of how fragile and precious life is. Although I did not lose anyone that I knew that day. I personally felt that my life was changed forever. The naïve sense of somehow feeling safe because I lived near the Nation’s Capital and so near the Pentagon, our airspace could NEVER be invaded by terrorists. I have not felt safe since then, and will never have that sense of safety again. Life was changed inextricably that day. ASIDE: a couple of years ago a church member of mine gave us a personal tour of the Pentagon (where he worked). He showed us where the plane crashed and talked about the memorial that would be erected there someday. He showed us the memorial inside of the Pentagon, and the enormous quilt that showed a personalized square and photograph of everyone who died at the Pentagon that day. I could not imagine anyone not being overcome with intense emotion, fighting back tears at the realization of how many people died that day. Every year on September 11th, everyone I know talks about that day years ago, where they were, and what they were doing. May we always take that moment on all September 11’s in our future. 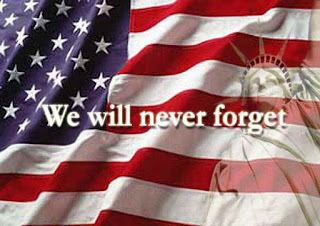 Those who lost their lives are gone, but will NEVER be forgotten.